From prophase, through metaphase and anaphase, to telophase, this set of models follows the process of mitosis. The separate forms, enlarged 2,000X, allow each stage to be studied one at a time, or collectively. Models 1–3 illustrate prophase; model 4, metaphase; models 5–7, anaphase; and model 8, telophase. Each model is mounted on its own stand. 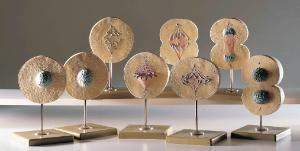 The set includes a manual describing the stages of mitosis. Size of each: 11 x 11 x 21 cm.